To implement the first phase, one selects the Hydrology | LID Controls category from the Data Browser to add, edit or delete individual LID control objects. The LID Control Editor is used to edit the properties of the various component layers that comprise each LID control object. For the second phase, for each Subcatchment that will utilize LIDs, one selects the LID Controls property in the Subcatchment’s Property Editor to launch the LID Group Editor. 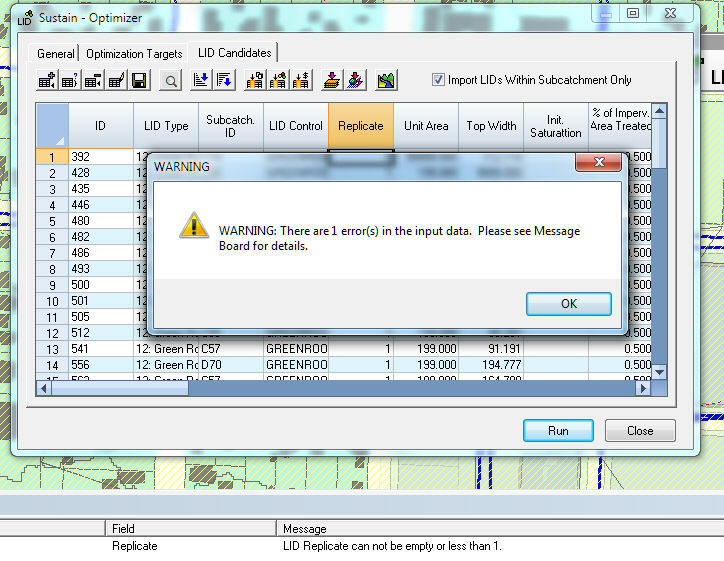 This editor is used to add or delete individual LID controls from the Subcatchment. For each control added the LID Usage Editor is used to specify the size of the control and what portion of the Subcatchment’s area that it treats. SUSTAIN-101: Runoff Control Target should be greater than 0. SUSTAIN-102: Pollutant Control Target should be greater than 0. SUSTAIN-001: Subcatchment ID can not be empty. SUSTAIN-002: Subcatchment ID could not be found. SUSTAIN-003: LID Control can not be empty. SUSTAIN-004: LID Replicate can not be empty or less than 1. SUSTAIN-005: Range of LID units is too high. (Max Unit – Min Unit) / Unit Step > 1000. SUSTAIN-006: Range of LID width is too high. (Max Width – Min Width) / Width Step > 1000. SUSTAIN-007: Range of LID soil thickness is too high. (Max Thickness – Min Thickness) / Thickness Step > 1000. SUSTAIN-008: Range of LID area is too high. (Max Area – Min Area) / Area Step > 1000. SUSTAIN-009: Max area of all LID candidates associated with Subcatchment ‘[Subcatchment ID]’ is too high. Sum(Max Area * Max Unit) > 5 * Subcatchment Area.